I made this to be my new bedside table. The top is a reclaimed laminated oak decking drop with a lemon yellow dye. 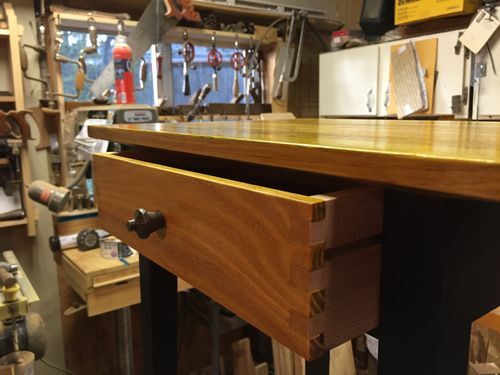 The drawer front is a piece of yellowheart from Lj john2005 I received in trade. 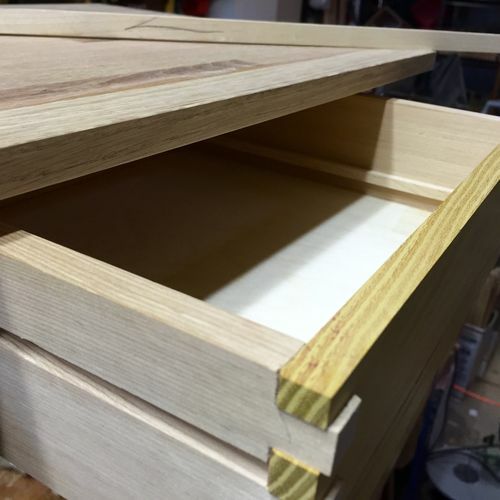 I made a false bottom in the drawer working around an errantly placed groove. 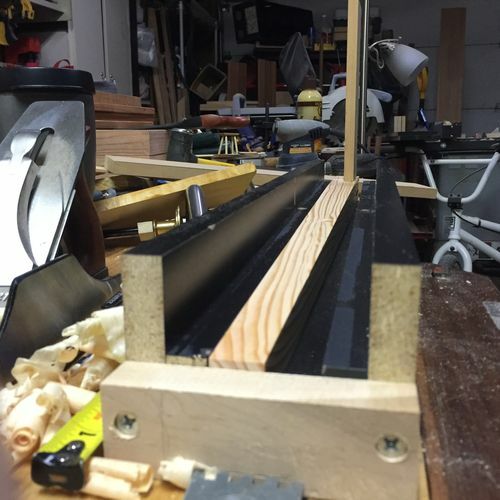 Leg frame is fir and hemlock stained with general finished ebony. Everything received a couple coats of Liberon black bison wax. I found the drawer pull in my youth during a flyfishing trip. It was a finial top from an old rod iron bed frame and I thought it would work well here. A lot of firsts for me during this quick build that I was happy to try. This is probably my first real finished furniture project. Thanks for looking. Some build pics. Great job, Woody. I dig the colors, and from the the pictures at least I think you did a bang up job color matching. Very nice table and work. 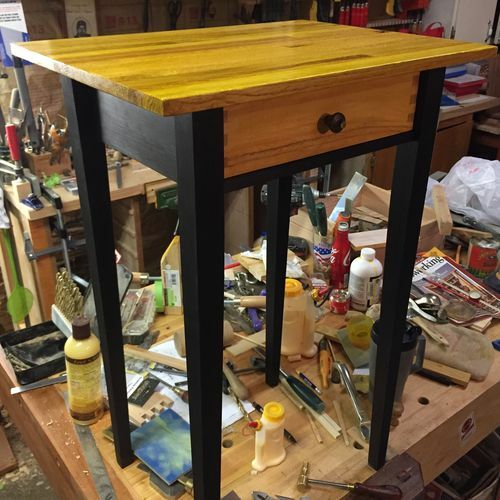 that came out real nice,i love the black ebony legs with yellow wood drawer and top.a nice clean simple look,and that finial works perfectly.also love the shape on the legs,you did a killer job on this. It was great watching this one come together. 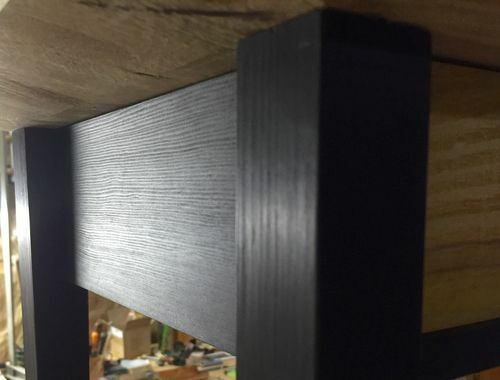 I couldn’t figure out what you had done with the dovetails till seeing it here. Great job. Nice job! That knob worked perfect. 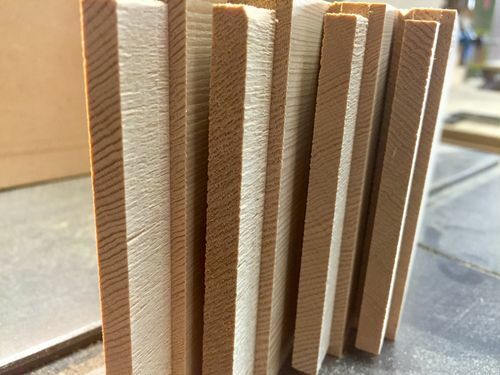 Cool history with it to go along with your first finished project. Great work, pal. I especially like the black legs and the overhanging top. Super job! Nice job. I like the ebony stain. That really looks great. Very delicate and elegant. That’s quite a side table, a real beauty. Just like the one I need. Black leggs look fantastic. Fine work – colors, proportions, pull knob. Well done.